Originally founded in 2000, Perri's Leather was based on a sincere desire to create a company that provided equestrian products that were a great value to both the retailer and the consumer. Recognizing a need within the marketplace to produce quality leather goods, (halters, bridles and training equipment,) the foundation of our company was laid. Perri's Leather, from its inception, specialized in (1) carrying a broad product line of staple items retailers must have in stock, (2) personalized service and (3) prompt delivery of orders. These are the cornerstones of our company. 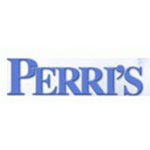 Today Perri's is proud to be carried by over 850 retail stores in the United States as well as Canada. Each year, as our company grows, we continue our focus on offering exceptional quality products at a great value. We take pride in developing a brand name that you can trust! It is our mission to provide top quality products, as well as great customer service and support to our equestrian community. We are able to do this because, we at Perri's, are equine enthusiasts with many years in the saddle. Our combined experience is a great asset for developing products you can count on! We are proud National Sponsors of the IHSA, IDA and many other local organizations.